Since my entrance and winning of titles over the past year or two, many nice comments have been made, and questions asked about my torso development. Especially about my back, and lately my chest as well. I've been working hard on my chest and back in the last six months, and I'd like to explain my exercises and training methods a little here. Before I get into that, I'd just like to say what a pleasure it is writing these exclusive articles for Joe Weider and Muscle Builder magazine. Not only am I completely free to write just what I want, I know for certain that the information is reaching the majority of bodybuilders in this country and abroad. If my training ideas can be of help to others, then I'm glad to make them public through the Weider magazines, for I know this is where they'll do the most good. Firstly, let me explain why I am combining both chest and back routines into one article. The plain fact of the matter is that I train these opposing bodyparts together, and train the chest and back in superset fashion. This article must include both of them to correctly explain my workout. I train my chest and back on Mondays and Thursdays, after warming up with some abdominal and calf work, and before finishing off with deltoid work. They, therefore, are the meat of my workout, the section I devote the most time and energy to. On those days, in addition to supersets, I also use several other training principles: Flushing, an essential to gorge and pump the muscle areas to maximum, insuring maximum growth. Quality Training, speed in your workout, is also helpful in keeping up the pump and pushing back the pain and exhaustion barrier, which you must do to develop your highest level of musculature. The Power Principle, for the maximum development of power and size, is a part of my workout also. I cheat a bit on the later reps of the later sets, particularly on the heavier movements. As many of you know, I originally started out as a weightlifter, working to develop power for that sport alone. It wasn't until I defected to America and came to realize the bodybuilding potential I had that I went into bodybuilding seriously. I must admit I was blessed with a naturally small waist, but in all my training for the power-packing of the back I made sure the back and legs were properly developed, without the unsightly thickening of the hips. When it came to thighs or lower back, I worked specifically on these areas, and avoided the hip development that was unnecessary to my weight lifting. As a result of this, I developed a powerful and well-developed body, without being thick. This gave me the basis for advanced power exercises for the upper and overall back, and enough development so that I do not have to specialize in this area for complete development; occasional weightlifting keeps my lower back in the pink and impressively thick. With this power basis it was only natural that I handled maximum weights for back development. I soon built up a 51-inch measurement, mainly on lat and back development, and this area was ahead of my pecs. 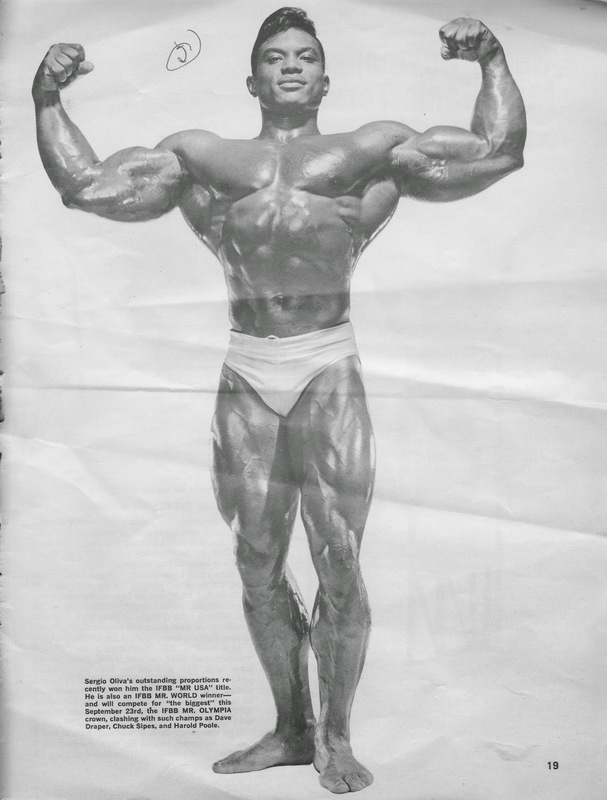 This was obvious to me after my loss in the Mr. Olympia 1966 event, and I mean to rectify it in 1967. With this in mind, I've added about 10 lbs in weight, mainly in the pecs and arms, since last September, and feel now my pecs are up to par with the rest of my development. I've gotten a lot of praise on them in recent posing exhibitions, so I must be headed in the right direction. I now devote about equal time and effort to my chest and back, combining Super Sets so as to give me development in all areas that I desire. I can best illustrate this by explaining fully to you my routine, exactly as I do it. 1) Bench Press - 20 full sets. I start with as warmup with 135 x 15 reps, then jump to 250. From here I go up in 10-20 pound jumps to 400 lbs, cutting down the reps as I go until I do about 8 reps with the 400. Then, I again go down with 10-20 jumps, keeping the reps 8-10 and going for maximum pump and stretch of the muscle. Naturally, I cheat a bit on the last few reps as I progress, but make sure I touch the chest each rep and stretch the pecs, really working them each and every rep. This is my staple exercise for the chest, and I move along as fast as I can, also to keep the pump going and to work the muscle with the greatest intensity . . . a combination of weight and speed . . . possible. 2) Chins - 10 sets with a wide grip for development of lat spread, and 10 sets with a medium grip for back thickness. I use a 50-lb dumbbell for added resistance, and do about 10-15 reps per set. Naturally, I do more reps with the widest grip possible at the very beginning, and as I progress I cut my reps to accommodate my strength and level of determination. As the grip comes in closer, this naturally helps to make the exercise a bit easier and conserve my strength as the full 20 sets progress. Again, I concentrate on intensity, the combination of speed and strength, in working my back. 1) Incline Barbell Press - 5 sets of 10 reps with 185-205 lbs. I prefer to do this exercise with a wide grip and the Olympic bar, hence the weights quoted. I make sure to bring the bar to my neck, elbows out, each and every rep, concentration being on the stretching of the upper pec and doing the exercise movement properly, rather than just how much weight you can handle. Keep your mind on the action of these muscles alone; 'think' the weight up and down. 2) Dips - 5 sets of 10 reps with an 80-lb dumbbell attached. I use this exercise to bring every little finger and striation of the pecs. To do this I work slowly and deliberately again, concentrating mentally on the action of the muscle. I go up and down as far as I can, and really work the muscle through a full range of motion. In fact, I guess you could call this a 'concentration set' instead of a Super Set . . . I use it to make sure the pec is completely and fully worked in all sectors. 1) Lying Laterals - 5 sets of 15 reps with 65-lb dumbbells. Now that I've completed the major portion of my chest workout, I combine a light shaping movement for the pecs with a heavy, lat developing exercise for the now-rested lats. 2) Lat Machine Pulldowns - 5 sets of 15 reps, 240 lbs. After anchoring myself securely so as to keep my exercise style perfect and not having to be distracted by keeping my balance with this weight, I go to lat machine pulldowns. I keep my back straight and think of my arms only as levers, allowing the lat muscles to pull he weight down. I make sure the lats only do the work, and I keep them spread out and my elbows pointed to the side at all times. I may cheat a bit and pull down the head and body a bit on the last few reps, but I try to avoid this. I'm primarily concerned with how much weight I can handle in proper style, the more weight the better. I find as I add to my lat power, so also do I add to my back sweep and thickness. 1) Press Behind Neck - 6 sets of 10 reps with 175 lbs on the Smith machine. To finish off the back (and as I go next to shoulders on my Monday/Thursday workouts), I do a heavy back exercise, for overall thickness, and a warmup movement for the delts. The press behind neck is performed in good style, standing, using the machine to keep the weight in the perfectly right track for maximum delt development. 2) Barbell Rowing - 6 sets of 10 reps with 250 lbs. Again I use maximum weight, to foster maximum growth of the upper back. 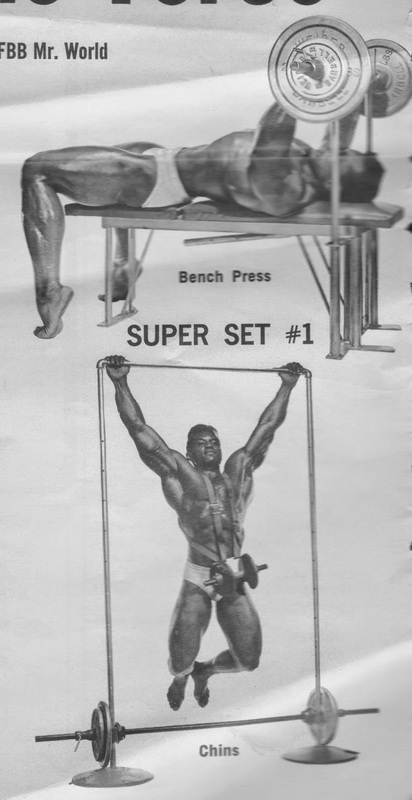 I make sure I hit the upper part by using a wide grip on the bar, and pulling the weight up to the upper body so that I touch the upper chest. This way I make sure the upper back and lats only are affected, and not the lower back. I use a loose, or cheating style, and work for power. I enjoy handling heavy weights, and psychologically feel I'm making better gains.